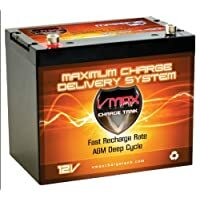 This battery from VMAXTANKS is a very powerful 12 volts deep cycle battery with precise deep cycling capacity. The Vmaxtanks MR107 deep cycle battery has dimensions 10.2 inches by 6.6 inches by 8.3 inches and it weighs around 60 pounds. It has various features like AGM electrolyte suspension technology, 100% maintenance free, easy mounting flexibility and many more, which make it a versatile and reliable marine battery. With HCA of 1380 A and MCA of 700 A, this battery is one of the best true deep cycle marine batteries. This battery is a 12 volts battery and it belongs to group 24. It has Hot Cranking Amps of 1380A and Marine Cranking Amps of 700 A that makes it a very powerful deep cycle marine battery. This battery has capacity of 85 AH and reserve capacity of 160 minutes. AGM design with recombinant technology, which eliminates the maintenance requirements like refilling distilled water. This battery is spill proof and there is no risk of acid spilling. It is also leak proof and doesn’t emit any harmful or flammable gas. The self discharge rate is extremely low and it is about 1% to 2% in a month, which makes the battery have longer life span. The plates of this battery are made from custom built alloys of Military grade. This battery has been approved for mobile vehicles, maritime and also for air travel, making it applicable for wide range of utility. It is not only resistant to heavy vibrations and shocks, but this marine battery is also resistant to extreme heat and it can withstand the worst weather conditions. Offers numerous power density and heavy duty deep cycle capabilities. Long service life of at least 8 to 10 years if used properly. Fast recharge and it is chargeable with smart AGM charger or microprocessor controlled charger with voltage of 14V to 15V. The Vmaxtanks MR107 AGM battery is specially designed for marine use and it is applicable of deep cycling purposes. It is an ideal choice for those enthusiasts and professionals who need a 12 volts marine deep cycle battery of group 24. It suits the best for boats and large 30 lb to 55 lb thrust Minn Kota, Cobra, Newport Vessels, Sevylor and many other trolling motors of the same parameter. Its application doesn’t end only at trolling motors as this battery can also be used to run other onboard boat or vehicle appliances. The best thing in this battery is its powerful deep cycling ability and true deep cycle feature which is available in an easily affordable price. With the high porosity absorbed glass mate electrolyte suspension system, the mate is able to completely absorb the pure electrolyte that is not contaminated with silicates or other unnecessary elements, which provides the battery with enhanced performance capability. The sealing is done so smoothly that there is no risk of spill or leak and this battery can be mounted at any position without any functional or physical damage. The lead-tin alloy grids improve the service life of this battery, giving it the same functioning capacity even after several discharges and recharges. The low internal resistance of the Vmaxtanks MR107 marine battery makes it 99% efficient and superior to other standard batteries of its class that are only 85% to 95% efficient. With this battery there is no risk of excessive gas accumulation within the battery as it has a special automatic resealing self releasing valve. A lot of time and also a lifetime expense can be saves as this battery requires least maintenance and needs no distilled water refilling. A very important drawback of this battery is that is only applicable for deep cycle purpose and in case it is used for cranking the functionality of the battery might be damaged reducing its service life. It is good only for trolling motors with 30 lb to 55 lb weight and might not be powerful enough for heavier ones and it may also be too much powerful for that with lighter weights. For lighter trolling motors you can go for VMAX857 marine battery; for the heavier ones you can go for Vmaxtanks MR137. The Vmaxtanks MR107 is a very powerful and high quality marine battery. Whether you are a marine hobbyist or professional, this battery is guaranteed not to disappoint you at any field. if I run an electric hookah dive rig that draws 26 amps, how long will the battery stayed charged?